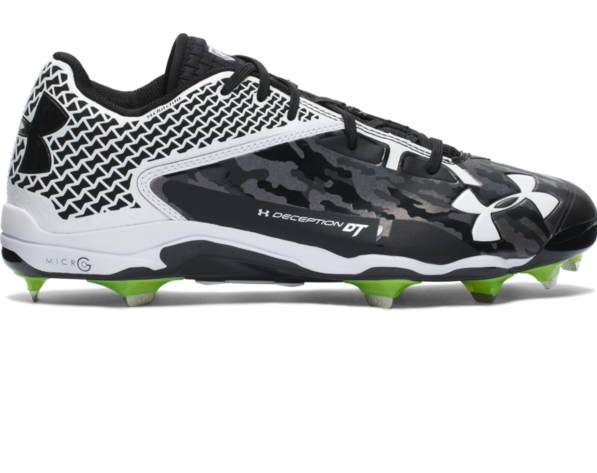 Let's take a look at the best performance cleats on the market, from the official performance footwear supplier for the MLB: The low-top Under Armour Deception DiamondTips Cleat. The UA Deception is not your standard baseball or football cleats. These comfortable and long-lasting shoes are full of major innovations that help bring maximum performance from players at any level of play. The most obvious thing that differentiates Deceptions from other cleats is the DiamondTips, which combines the flexibility and elasticity of rubber cleats with the sheer cutting power of metal. Each molded green rubber cleat has a sharp metal cutting surface embedded inside it, extending outwards to form the tip of the cleat. In practice, these are like no other cleats we've ever felt. All-metal cleats, of course, are extremely hard and unyielding, making them great for cutting turf... but can also be uncomfortable to wear and encourage ankle injuries due to their lack of rotational movement. By embedding the metal tips within generous rubber mounts, the DiamondTips truly give the best of both worlds. The rubber mounts spread the impact across a wide area of the sole, giving plenty of flexibility and some extra oomph when pushing off, while still having enough cutting power to create a great grip. This is aided by Under Armour's Rotational Traction technology, which arranges the cleats in a circular pattern around the ball and heel. By doing so, they work with the natural movements of the foot to bring extra speed and agility to every stride. Under Armour also deploys multiple innovations in interior foam, to reduce weight as well as making the Deceptions comfortable to wear, even into overtime. Low-to-the-ground cushioning comes from their Micro G foam, which is specifically designed to be thin and lightweight, while still bringing significant compressive force. With each step, the foam adds energy to the foot, creating explosive power that drives a player forward. Above that, there is the 4D Foam insole. This molds comfortably to the exact shape and size of the player's foot, creating a glove-like fit that minimizes movement of the shoe around the foot. This adds significant extra stability, as well as reducing friction and the blistering that can come with it. Heel and ankle support comes from UA's ClutchFit technologies, which similarly molds itself around the foot to create a "second skin" that's-in our opinion- far superior to most interior grips. And on top, a 3D-molded tongue hugs the top of the foot, and ensures a perfect fit all the way around. The result is a cleated shoe which is remarkably lightweight - less than 12oz - while bringing maximum comfort and power to every step.